Last May I left my job installing solar electric and solar hot water systems. Since then, I have been working towards starting my own business and I am proud to announce Spartan Solar! We are focusing on solar hot water to start. Learn more about our services at: goSpartanSolar.com. In the 1800’s and into the early 20th century we used to get our refrigeration done using ice–including during the summer. 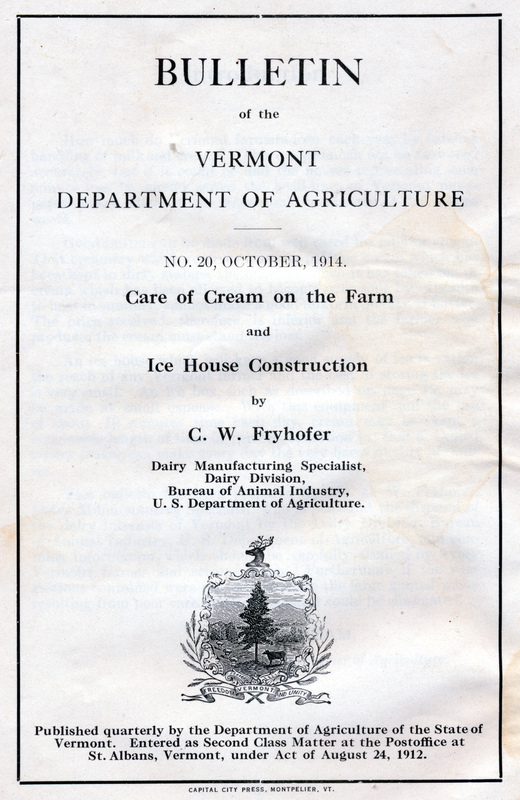 Ice was harvested and stored in specially designed buildings and then distributed/used as needed. I recently happened across a thorough article on the topic in the journal of Early American Industries: The Chronicle Vol 66 #4. There is much interesting history in the article, but the relevant part was about the specially designed buildings. They were often made with none other than double stud walls with 10-12″ off sawdust insulation. In other words: cellulose! For those that are just starting to read this blog, our super-insulated home is exactly that: double stud, 2×4 and 2×4 walls, with 12.5″ of dense packed cellulose. I thought we were on the forefront of super-insulation design by having such a wall system, but we are actually implementing designs that are over 100 years old! – The double stud wall has a 4″x10″ bottom plate, with 2 sets of offset 2×4’s connected and spaced with a single horizontal 2×4 roughly mid-way between the top and bottom of the balloon framed studs. – The exterior sheathing consists of a single layer of 7/8″ tongue and groove boards faced with “waterproof insulating paper” and sided with novelty siding or similar. The interior is sheathed with 2 layers of 7/8″ tongue and groove boards sandwiching similar paper. Unfortunately, I am unable to provide any insight into what the composition of what this insulated paper might be. Perhaps it was simply tarred felt paper? The double layer of interior sheathing is interesting; perhaps this was just to protect the insulating paper? – I was surprised and impressed to see that triple pane glazing was used! – There is a sophisticated appreciation of air flow and drainage. – “Tarred Felt” was extended vertically part way into the top of the stem-wall–a detail whose purpose I am not sure of. 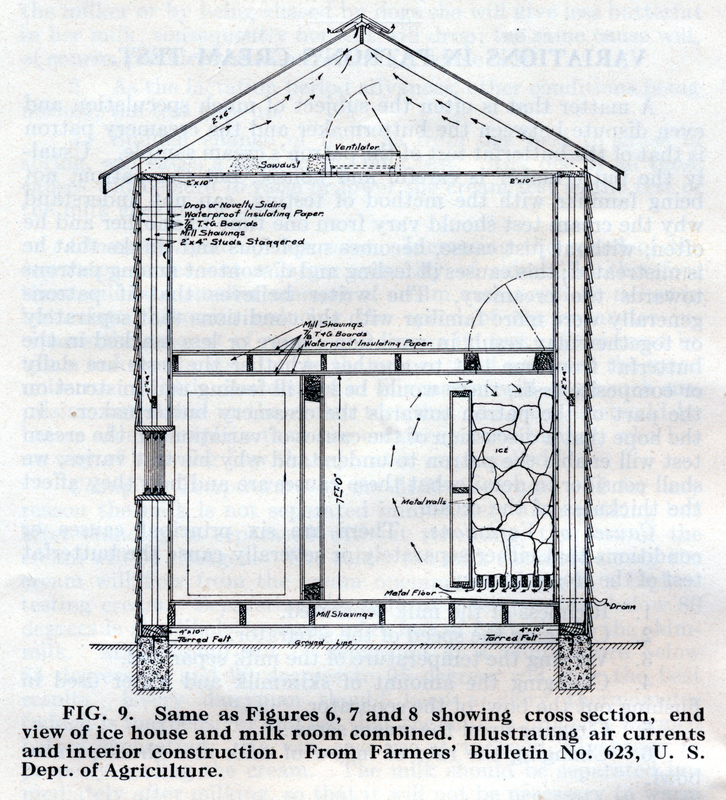 – Although the diagrams below show more sawdust used for horizontal insulation above the ice, Paul Wood informs us that marsh grass, and occasionally straw, up to 24″ thick, was commonly used directly on top of the ice. Marsh grass was preferred for its rot resistance. I wonder if there is a lesson here that would be worth re-learning? Folks who are interested in natural building and straw-bale design need to be vigilant in protecting the bales from decay–perhaps marsh grass bales would be a useful alternative? 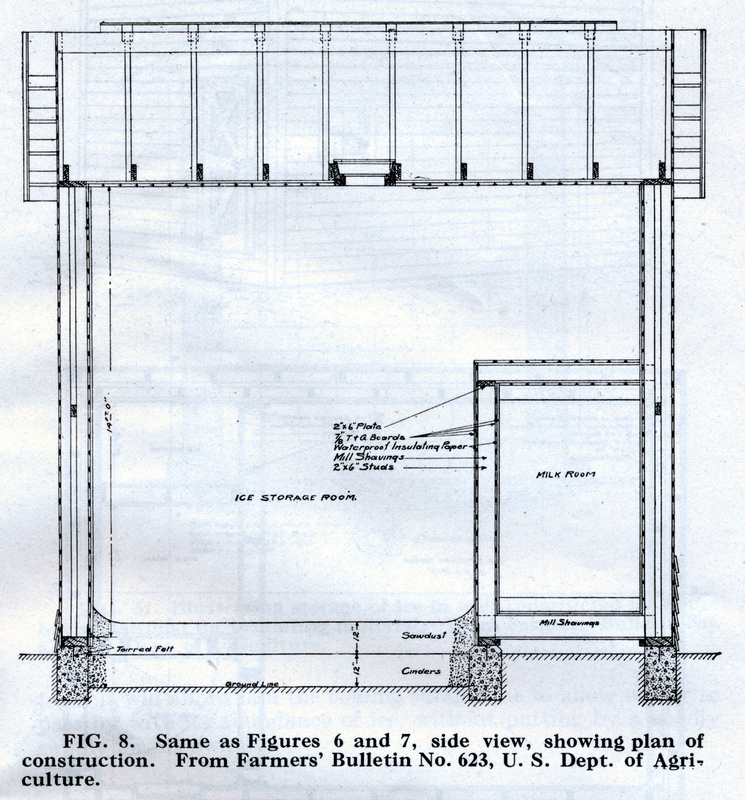 – Noted in Paul’s article and not on the diagrams, white-wash was sometimes used to keep the ice-house buildings cooler. Also, the sawdust would have to be replaced annually, since it would degrade. 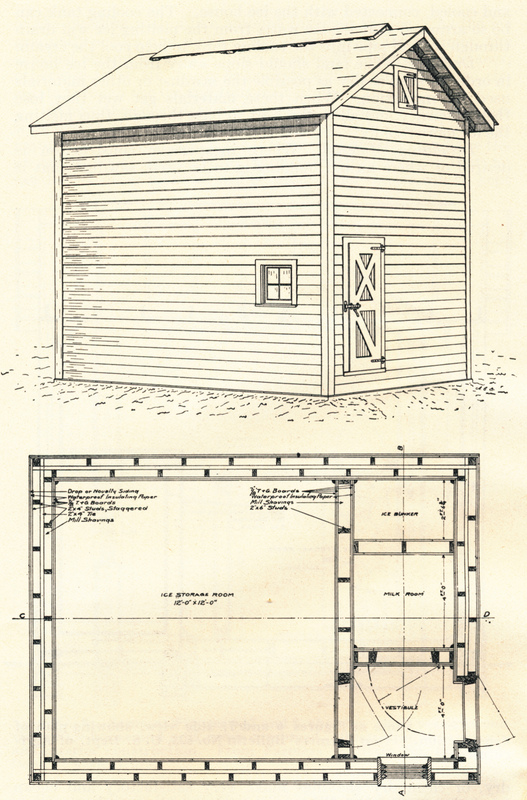 Plan view and assembly details of ice house. Note attention to ventilation and drainage. Another plan view of the ice house. Installing one in the first floor bathroom fan was easy since the duct-work was exposed in the mechanical room. After putting one in the duct, I was, however, disappointed to still feel cold air coming through the damper, primarily through the hinge. I have seen some models where the hinge is taped, and I considered adding tape myself, but I was worried that the tape may not last/or actually cause problems. Instead, I put two dampers in the duct, which satisfactorily blocked the flow of cold air. The second floor bathroom fan duct-work is permanently not accessible so I removed the fan from its box exposing the beginning of the duct. This was challenging only because the fan is 12′ up on a cathedral ceiling. The downstairs bathroom went from being drafty and cool to being the warm interior space you would expect. The fans make a bit more noise as a result of the added air resistance, but I am not too worried. The Panasonic fans have variable speed motors in them and are designed to compensate for duct-work resistance. I would recommend these dampers to anyone who is looking for easy improvements to their home’s energy efficiency. I bought mine from IAQ Source which seemed to have a better price than most. If you are building new, it would be cheaper to use an in-line backdraft damper like Fantech’s which also wouldn’t restrict the air-flow as much. WMECO gave us permission to turn on our PV system on October 23rd, so we have been creating solar power for 9 days now. Today, we hit the 100 kWh mark. That averages to 11 kWh per day, which is also our average daily usage throughout the year. One of the great things about using a system with micro-inverters is that you can monitor each panel individually. 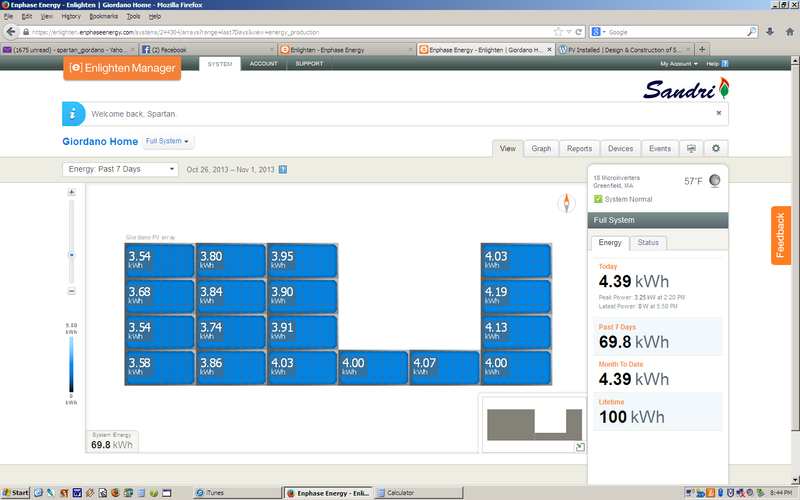 Here is a screen shot from Enphase’s monitoring software for our system. The numbers on each panel represent the sum total of the past 7 days of power creation. You can see that the panels on the left are slightly lower than those on the right. These are the ones closest to our favorite silver maple tree. The “hole” in the middle of the system is where the solar hot water panels are. Data logging! Average energy for cooking. So I feel incredibly nerdy right now because I am very excited about the information that we are gleaning from the data loggers in place around the house. One of them, a TED 5000 installed May 2013, has been monitoring the electrical consumption for our cooking, which we do a lot of. Our stove is a standard glass-top. We now have a pretty good sample of time (mid-April through mid-October) including “canning season”. In an effort to create a more detailed picture I isolated the canning period: September 1st through October 4th. Extrapolating out we can expect to use 535 kW/year cooking and canning, and, based on last year’s total electricity usage, this would be 13% of it. The cost for electricity for us has been around 18.5 cents/kW so we can expect to spend about $100 per year cooking. The TED 5000 is also monitoring our air source heat pump, which has pretty much been off since May. We used it for a total of 12 days this summer 11 of which were in June and 1 in September. A total of 35.7 kW was consumed at a cost of $6.60. Eventually I will get around to calculating how many Btu’s the heat pump is putting in (or taking out of) our home. This requires knowing how efficient the heat pump is at various outdoor temperatures, and what the outdoor temperatures are on, I would imagine, at least an hourly basis. Speaking of the outdoor temperature brings me to more exciting news: we just purchased two more temperature loggers! Last winter I moved our one logger around the home which left us with no perspective when viewing the data. Going forward, we will be able to compare outdoor temperature to first to second floor temperature data. 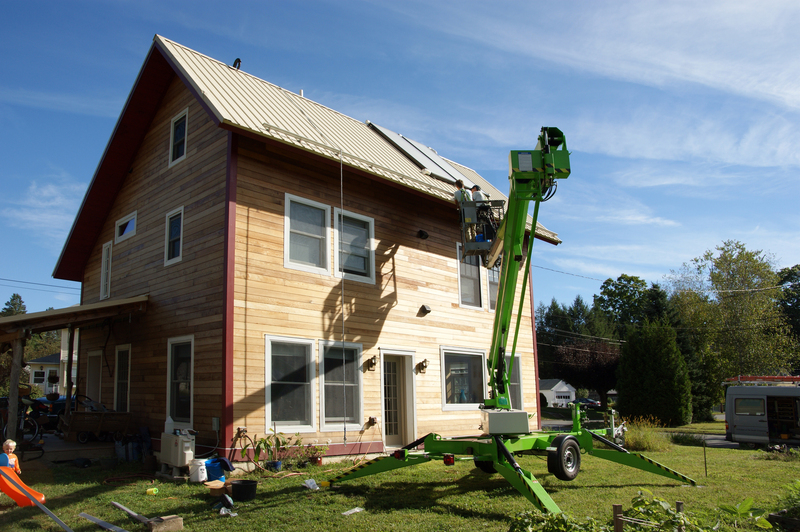 The outdoor logger is out of the sun about 8′ from the west side of the house and 4′ off the ground. The second floor logger is in our master bedroom. Now that we have data logged our cooking use, I will be switch over to monitoring our refrigerator. Stay tuned! It took Adam and I and the electricians 4 days to install our 18 panel 4.5 kW grid-tied solar photovoltaic system. At two full stories to the eave, a 2 foot overhang, a 12:12 pitch, and a slippery-when-wet roof, a lift was certainly in order. After deciding layout, installation began with snapping a chalk line for the first rail. Working with Adam on our house again was fun in a nostalgic sort of sense. Of course, this time we were both getting paid as Sandri employees–it isn’t every day that you get to hire yourself! Adam and Spartan installing the first rail. The rails are attached to the roof using S5!’s new Protea clip. It is specifically designed to adapt to any metal roof with trapezoidal ribs. The fantastic thing is that they don’t need to be sunk into the trusses/rafters. 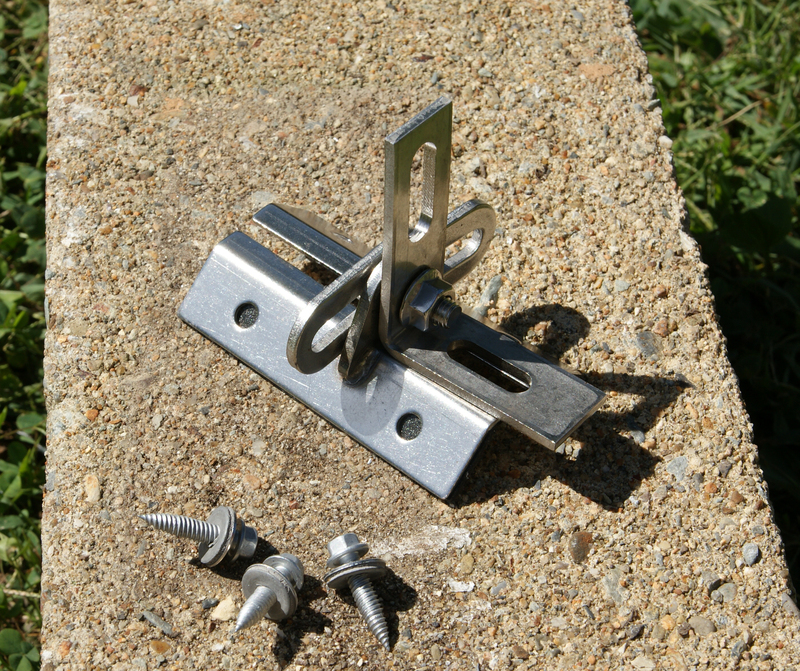 They simply attach to the metal rib using four gasketed sheet metal screws. These clips were a huge boon to us because our house has cathedral ceilings across the entire roof; no access to the trusses. The manufacturer claims the clips can take 1000# uplift. When we walked and moved around on the rails, Adam and I both felt that they were more stable than rails mounted with standard Eco-feet with L brackets. The S5! Protea clip has a butyl adhesive strip underneath the clip that seals it to the sides of the rib. No caulk required! We did encounter a serious problem though. We use Ironridge’s XRS rail which asks for a 3/8″ bolt with a 9/16″ head to connect to the clip. Unfortunately, the vertical slot in the clip is 5/16″. We found out the hard way that you can’t get a 5/16″ bolt with a 9/16″ head. We solved the problem by having a local fabricator mill out the slot to 3/8″. It only added less than $2/clip. I am not sure if S5! would have had a solution for us because they did not return our phone calls or emails in a timely fashion. Schletter makes a comparable clip as well and if we do this again we will be looking into it. 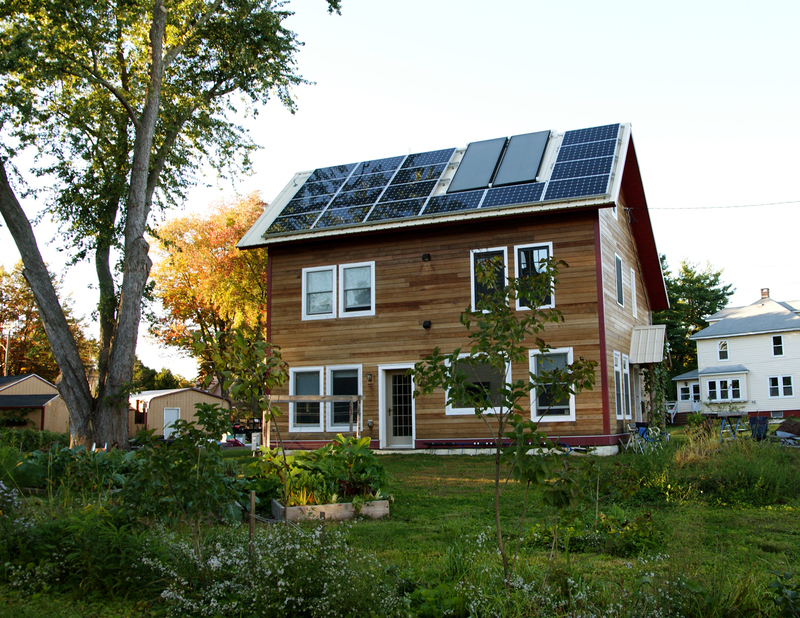 Solar panels produce DC electricity so you need an inverter/s to convert to AC. Although somewhat more expensive than a single inverter, we chose to use micro-inverters. This means that each panel has a dedicated inverter beneath it. This allows the system to overcome some of the problems associated with shading. In a typical single inverter system, if any panel is shaded, all of the other panels can only produce as much as the shaded one. Since we have a large silver maple tree right next to our house micro-inverters were essentially a necessity. 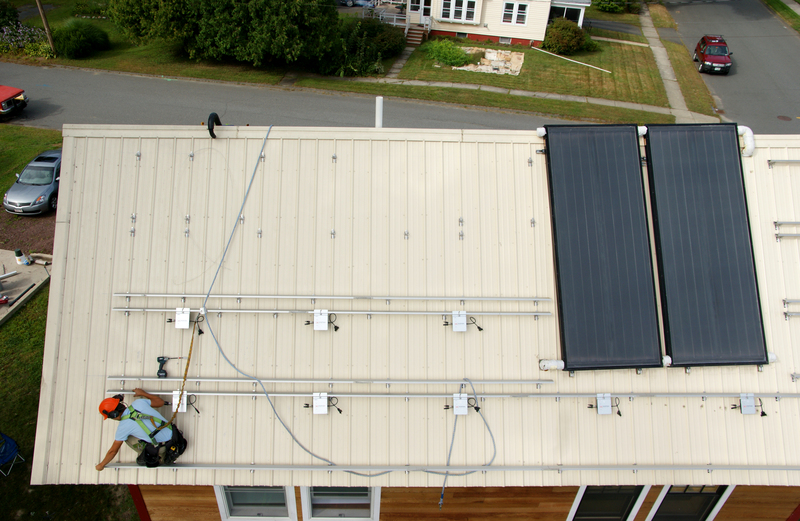 At present time, there are only a few microinverters on the market: PowerOne, Renesola, and Enphase. We went with Enphase in large part since they have been on the market the longest. When you choose a micro-inverter you are also signing up for the same company’s monitoring system. You can log into your system via a web portal and see statistics for each panel as well as the entire system. If any panels are not functioning you will know. Before we put on the panels I took a final set of solar access photographs using our Solmetric Suneye camera that uses a fish eye lens to photograph the sky. After orienting the camera towards south and leveling it you take a photograph that is instantly analyzed by the on-board software. Our annual solar access average is at least 85%. I say at least because we removed one final branch using the lift after the shots were taken. Left to right is East to West on the roof. I wanted to use US made solar panels so we went with American Choice panels sold by Renewable Sales. The panels are in fact re-branded 1Soltech panels made in Texas. 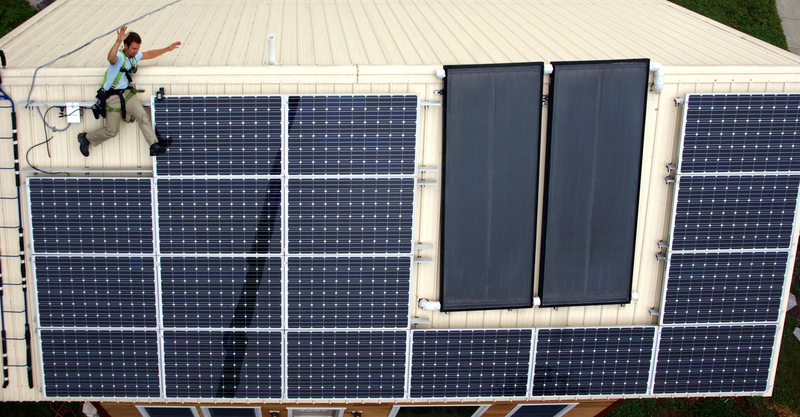 Each panel is rated to create 250 watts/hour. The rating system baseline is actually somewhat worse than the amount of sun we get in Greenfield Massachusetts so, shading aside, one can expect to see more than 250 watts per panel under ideal conditions. Our soon to be net-plus home. As solar installers, Adam and I often get asked if we install systems with battery back ups. Unfortunately, battery technology/costs are not at a place where it is economical. However, there are a couple of promising workarounds coming on the market that, when the grid is down, allow electricity from the panels to be used in real time without batteries. One of them is an inverter by SMA that provides up to 1500 watts on a dedicated switched outlet.